The Philadelphia Eagles are the 2018 Super bowl champions. To help celebrate their victory against the New England patriots, get the championship gear today. 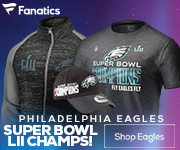 Click the link below and get the latest apparel form Fanatics to add to your collection. The upset victory over the Patriots has given the eagles their first super bowl win.